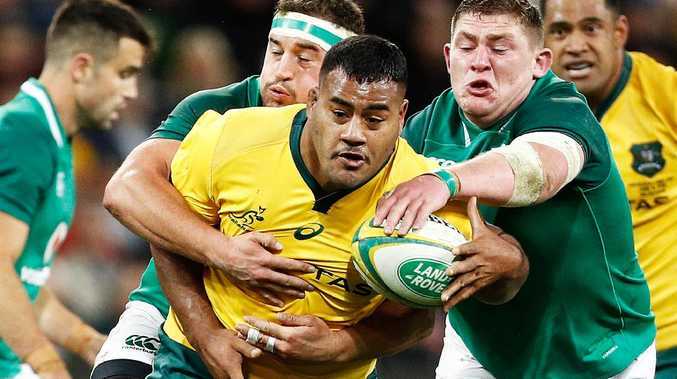 THE Wallabies have suffered a major blow ahead of tonight's Bledisloe Cup match with rampaging prop Taniela Tupou ruled out of the clash against the All Blacks in Sydney. It's understood Tupou suffered a hamstring injury in the team's final training session on Friday. 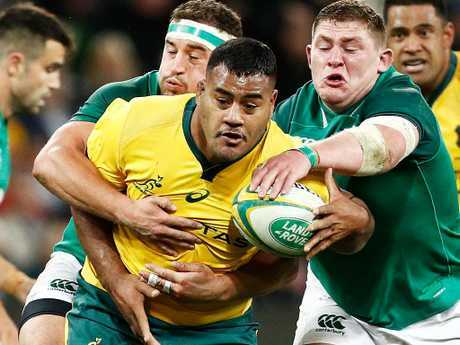 The Wallabies had already lost a key frontrower earlier this week when loosehead Scott Sio was ruled out of the match with a shoulder injury. That forced coach Michael Cheika to bring Tom Robertson into his starting side to accompany Tatafu Polota-Nau and Sekope Kepu - a trio that has never scrummaged together. Tupou was to have been a damaging figure off the bench, injecting his huge 135kg frame into the match while anchoring the scrum when replacing Kepu. 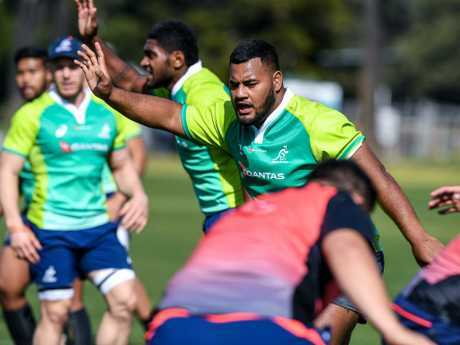 The 22-year-old, nicknamed Tongan Thor, had trained strongly for the past fortnight and some believed he should even start this match despite playing just four internationals. His form during the June series against Ireland, and during the Super Rugby season for Queensland Reds, made Tupou one of the standout players in Australia this year. He revealed recently that he could well have been playing for the All Blacks if not for a bureaucratic bungle when he was playing in Auckland schoolboys. When he was told he would not be considered for the representative schools team four years ago, he made up his mind to defect to Australia. Tupou would have been playing his first match against New Zealand tonight. His hamstring injury is believed to be minor, and there could be a chance he will be fit for next week's return clash in Auckland. Reserves: 16. Tolu Latu 17. Allan Alaalatoa 18. Jermaine Ainsley 19. Rob Simmons 20. Pete Samu 21. Nick Phipps 22. Matt Toomua 23. Jack Maddocks. All Blacks: 15. Ben Smith 14. Waisake Naholo 13. Jack Goodhue 12. Ryan Crotty 11. Rieko Ioane 10. Beauden Barrett 9. Aaron Smith 8. Kieran Read (captain) 7. Sam Cane 6. Liam Squire 5. Sam Whitelock 4. Brodie Rettalick 3. Owen Franks 2. Codie Taylor 1. Joe Moody. Reserves: 16. Nathan Harris 17. Karl Tu'inukuafe 18. Tim Perry 19. Scott Barrett 20. Ardie Savea 21. TJ Perenara 22. Damian McKenzie 23. Anton Lienert-Brown.